In a news conference on missing Malaysia Airlines Flight 370 today, Prime Minister Najib Razak declared that the plane was deliberately diverted from its prescribed route to Beijing, flying up to seven hours after takeoff, says The New York Times. Malaysian authorities have released a map plotting the plane's last satellite signals somewhere along two large arcs crossing Asia. Mr. Najib said the last satellite transmissions from the plane, which originated either from an arc between Kazakhstan and Thailand or another arc between Indonesia and the Indian Ocean, indicate a purposeful change to the flight path. 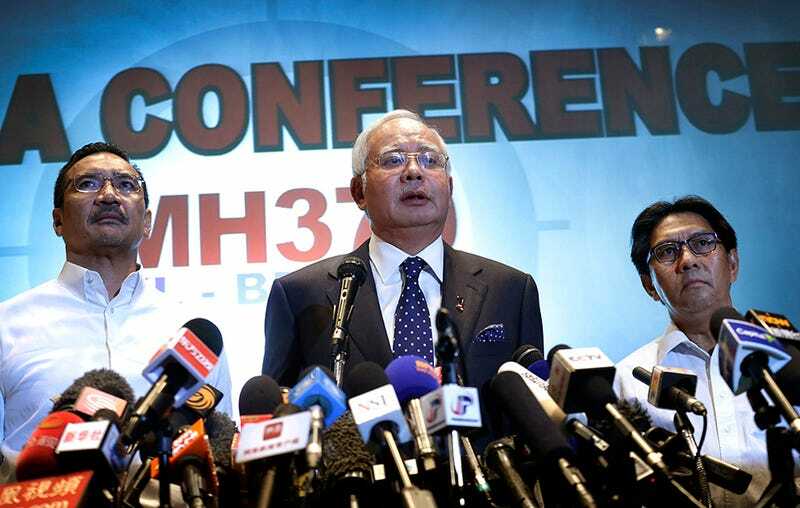 "These movements are consistent with deliberate action by someone on the plane," Mr. Najib said. The news comes after yesterday's assertion that the plane made a rapid climb past 45,000 feet and changed course several times after disappearing from radar. The northern flight approximation calculated from the plane's last satellite signal would have the plane passing through highly militarized airspace, including areas patrolled by the U.S. military, NYT reports. Mikael Robertsson, a global aviation tracking expert, told The New York Times that the plane's communications systems were shut down as the flight transitioned from Malaysian to Vietnamese air traffic control space, in a way that would make the plane's absence less noticeable. NYT also reports that police officers raided the residential compound today where Flight 370's pilot lived.